I hope this year brings you many wonderful travels, helps you check off a few bucket list places, as well as discover some unexpected places and countries that surprise you. If like me you sometimes watch too much of the news (or even Facebook for that matter) it may feel like there are days when the planet and human population is spinning off its axis. When each news story seems crazier than the last. I firmly believe one of the best ways we can stay grounded in ourselves and positivity is trough travel. The more I travel, the less afraid I get and the more I see we how much we share in common. Even in countries where on the surface it might look like we are wildly different – when I go and meet the locals I find out we have a lot more common than we do different. I find locals are kind and go out of there way to make you feel at home in their country. Recently while exploring Morocco, I was again reminded that while an ocean and a continent may separate our homes, we still have so much in common. At the most basic level people are kind, generous and want the best for their families and friends. 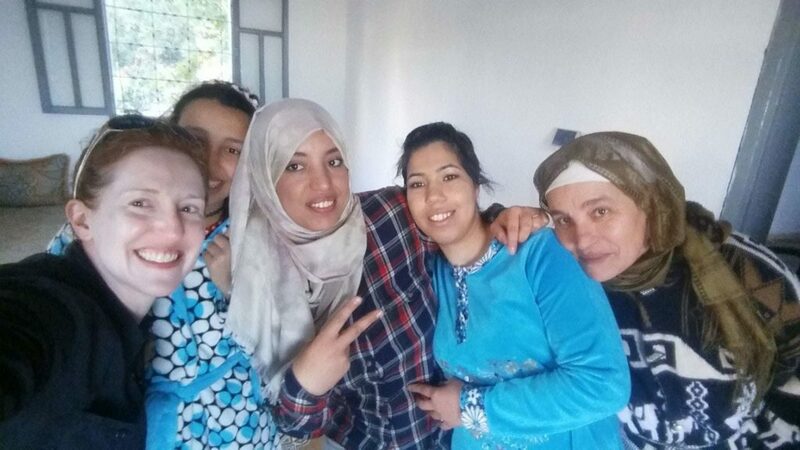 While I was researching and photographing in the tiny hamlet of Moulay Idriss – a place few travelers visit let alone stay – I had the wonderful opportunity to share lunch with Fatima, who ran the hotel I was staying at. We went to her home and had lunch with her mother and sisters. Before long we were all laughing over steaming bowls of couscous chatting about how we preferred living in the quiet suburbs to the busy cities, how we loved walking amongst beautiful mountains, what our families were like, and of course sharing stories of love and places we dreamed of visiting in Morocco. And even how much we all adored the cute donkeys of Moulay Idriss. Enjoying lunch with Fatima and her family. It’s the locals we meet and the memories we take home that are our biggest souvenirs when traveling. The smiles, the laughs, the new friends, and the moments of connection. Whether traveling to a nearby city or a far away country – traveling is a great tool in 2018 for breaking down boundaries, counteracting the fear narrative in the media, and staying positive and grounded. I challenge myself as well as you to visit somewhere this year that takes us out of your comfort zone and to go meet the locals. We can learn so much from each other. In our January Travel Newsletter, I share my Top 12 Destinations to Visit in 2018, announce the opening of ArchaeoAdventures’ Majestic Morocco Tour 2018 (mark your calendars for October 3-13, 2018 and sign up to join me! ), share an update on our Egypt April 2018 tour and begin our 30 Days of Travel which we will be sharing all January. Thank you for being here, for sharing your love of travel with us, and for your curiosity in exploring this exciting planet we live on. We will see you all #OnAdventure in Egypt, Morocco, Jordan, Peru or wherever your travels take you! Explore our upcoming 2018 Tours to Morocco and Egypt. Join us and experience these amazing countries!